We are two weeks in - two weeks into the school year. Ten days of planning instruction, building relationships, implementing routines, and getting to know our students. As the year begins, as I walk the hallways, peek into classrooms and sit in planning meetings...I can’t help but take note of how much I love my teachers and staff members. There is an excitement in the air, a hint of what’s to come, and a feeling that something amazing could happen at any moment. It is clear we have a building filled with educators who love their children, are willing to work painfully hard preparing for each day, and all share a willingness to collaboratively reflect on the process of ensuring every child receives the best education possible. I left the classroom four years ago, this will be my fifth year away - I would be lying if I said I didn’t miss it, because I do, almost every day. To me, there was nothing more exciting than the first two weeks… Meeting my students for the first time, creating a first impression that would last the entire year. As I walk the hallways I see teacher after teacher creating a memorable first impression, one built on love and respect. But...there is something about the first two weeks of school that always gets to me. I miss the overwhelming feeling of nervousness as I prepared for that first day. I miss looking over my lesson plans to ensure what my students experienced for the first time would be memorable. I miss trying to imprint each student's name into my brain before lunch. I miss planning with my team, welcoming new families, and trying to identify the need of each student who walked in the door. There is nothing like being a teacher. It is hard, it takes time, it is exhausting, emotionally draining, and a daily challenge. Yet...I miss it. 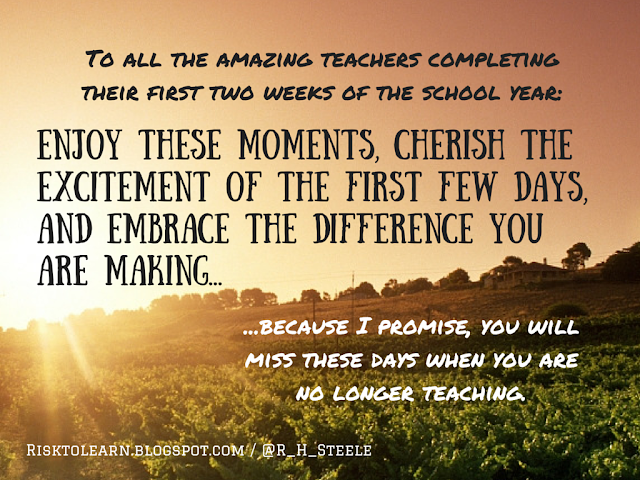 The first two weeks are a wonderful time of year - So, to all teachers completing their first two weeks of the school year let me just share this: Enjoy these moments, cherish the excitement of the first few days, and embrace the difference you are making...because I promise, you will miss these days when you are no longer teaching. Excellent advice and a great reminder of how fortunate we are to be teachers. Yep!! I miss it too! But im impressed with Christie's team of educators.